The shuttle Endeavour, carrying six astronauts, a 15-ton life support module and a bay window observation deck for the International Space Station, thundered into orbit early Monday, putting on a spectacular pre-dawn show in the program's final planned night launch. With commander George Zamka and pilot Terry Virts at the controls, Endeavour's three main engines ignited with a rush of fiery exhaust and quickly throttled up to full power. Seconds later, at 4:14:07 a.m. EST, the shuttle's twin solid-fuel boosters fired, explosive bolts detonated and the spaceplane vaulted away from pad 39A. A launch attempt Sunday was called off due to low clouds over the Kennedy Space Center, but the weather cooperated for the second attempt. While low clouds caused concern early in the countdown, they thinned out as launch time approached. Live television views from a camera mounted on the side of the ship's external tank showed what appeared to be a relatively long piece of foam insulation falling from the tank about two minutes into flight. Bill Gerstenmaier, chief of NASA's space flight operations, said the debris did not appear to strike the shuttle's heat shield. "At about two minutes, we saw a piece of intertank stringer foam come off," he said. "It's probably about a quarter inch thick, maybe about a foot or so long. It didn't appear to impact the orbiter and we see no damage to the orbiter. It's something similar to what we've seen before." Endeavour's huge boosters appeared to perform normally, separating as planned about two minutes and five seconds after blastoff. 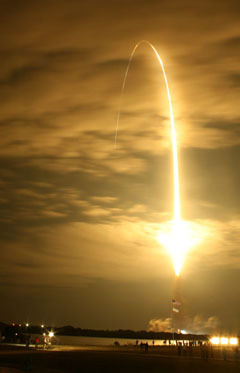 The shuttle's hydrogen-fueled main engines continued firing for another six-and-a-half minutes, boosting the spaceplane into the planned preliminary orbit before shutting down at 4:22 a.m.
"Just got a fantastic view from Long Island of Endeavour on it's way to orbit!" Tom Liverani, a space enthusiast, said in an email. "Was able to see approximately 30 seconds of powered flight. Unbelievable sight!" "Saw last 20 seconds of powered flight then another 30 seconds of RCS (maneuvering jet firings) as they were getting off tank," Haas emailed. "Always so cool to see it launch on TV and then step out and see it fly by eight minutes later." Zamka, Virts and their crewmates - Kathryn Hire, flight engineer Stephen Robinson and spacewalkers Robert Behnken and Nicholas Patrick - faced a busy first few hours in space, doffing their bulky pressure suits and rigging Endeavour's systems for orbital flight. The primary goal of the mission is the delivery and installation of the Tranquility module and a seven-pane cupola that promises spectacular bay-window views of Earth and approaching spacecraft. Tranquility will be attached to the left side of the station's central Unity module, providing a home for life support equipment, exercise gear and a toilet, all currently housed elsewhere in the station. The astronauts also will deliver replacement hardware to overhaul the lab's water recycling system, the complex equipment that turns sweat and urine into ultra-pure water for drinking, crew hygiene and oxygen generation. The system has been out of action in recent weeks because of higher-than-expected calcium concentrations in a critical distillation assembly. "Once those racks have been moved into Tranquility, they will be out of the laboratory spaces so the labs can be for science and Tranquility will become the home for the water regeneration system, the atmospheric revitalization system and those things. And also exercise. ... So that's a big change for the astronauts." The other major addition - the multi-window cupola - will improve the quality of life aboard the station. Full-time crew members now have sleep stations and internet access. With Endeavour's mission, they will get a bay window on the world. Along with providing a home for a robot arm work station, the cupola will let the crew "look outside," Zamka said, "it'll be kind of a hemispheric place where they can look out and see tremendous views of the Earth." "We are exceptionally excited about the prospect of sending this crew on its way to the International Space Station," said lead shuttle Flight Director Kwatsi Alibaruho. 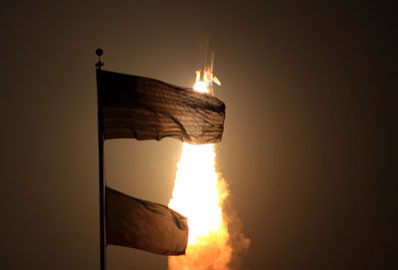 "This mission is not only the first mission of 2010, it's also expected to be the last night launch of the shuttle, and so many folks are excited about seeing that. "This mission also represents the end of U.S. segment assembly. Node 3 is the last U.S.-produced module which will be added to the International Space Station."